Physics of Cryogenics: An Ultralow Temperature Phenomenon discusses the significant number of advances that have been made during the last few years in a variety of cryocoolers, such as Brayton, Joule-Thomson, Stirling, pulse tube, Gifford-McMahon and magnetic refrigerators. The book reviews various approaches taken to improve reliability, a major driving force for new research areas. The advantages and disadvantages of different cycles are compared, and the latest improvements in each of these cryocoolers is discussed. The book starts with the thermodynamic fundamentals, followed by the definition of cryogenic and the associated science behind low temperature phenomena and properties. 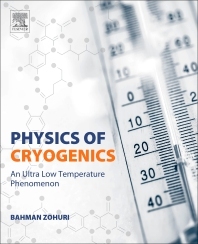 This book is an ideal resource for scientists, engineers and graduate and senior undergraduate students who need a better understanding of the science of cryogenics and related thermodynamics. Dr. Bahman Zohuri is currently at the Galaxy Advanced Engineering, Inc. a consulting company that he started himself in 1991 when he left both semiconductor and Defence industries after many years working as a chief scientist. After graduating from University of Illinois in field of Physics and Applied Mathematics, he joined Westinghouse Electric Corporation where he performed thermal hydraulic analysis and natural circulation for Inherent Shutdown Heat Removal System (ISHRS) in the core of a Liquid Metal Fast Breeder Reactor (LMFBR) as a secondary fully inherent shut system for secondary loop heat exchange. All these designs were, used for Nuclear Safety and Reliability Engineering for Self-Actuated Shutdown System. He designed the Mercury Heat Pipe and Electromagnetic Pumps for Large Pool Concepts of LMFBR for heat rejection purpose for this reactor around 1978 where he received a patent for it. He then was, transferred to defence division of Westinghouse later, where he was responsible for the dynamic analysis and method of launch and handling of MX missile out of canister. He later on was a consultant at Sandia National Laboratory after leaving United States Navy. Dr. Zohuri earned his Bachelor's and Master’s degrees in Physics from the University of Illinois and his second Master degree in Mechanical Engineering as well as his Doctorate in Nuclear Engineering from University of New Mexico. He has been, awarded three patents, and has published 26 textbooks and numerous other journal publications.